The M.U.S.C.L.E. 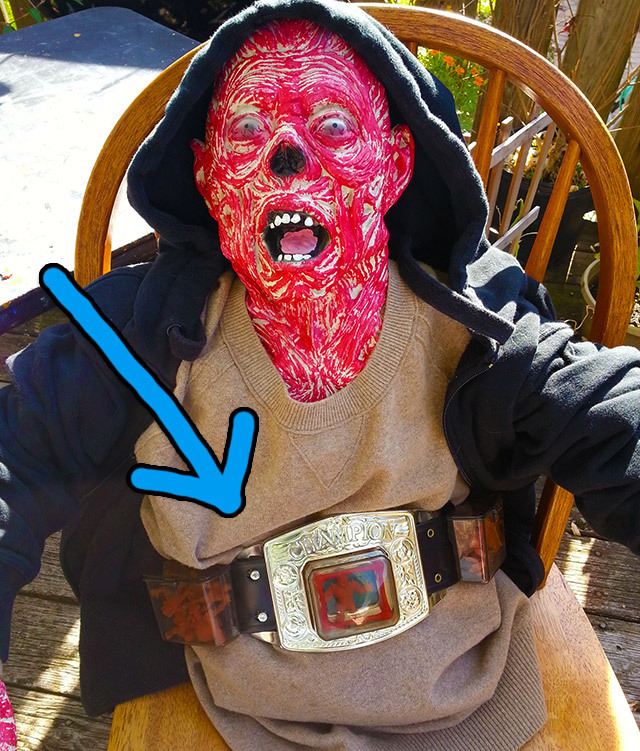 Battlin' Belt! | Dinosaur Dracula! M.U.S.C.L.E. — that’s Millions of Unusual Small Creatures Lurking Everywhere — is one of my favorite toy lines ever. Imported from Japan where they had a more richly defined story, I prefer the simplified version we got in the States: They were just piles of wacky, nameless wrestlers, nearly as inexpensive to collect as Garbage Pail Kids, but 800 times more fun. Most typically sold in 4-packs, M.U.S.C.L.E. figures were also sold in 10-pack cans and 28-pack boxed sets. Barely more than an inch tall, they were essentially super detailed vending machine toys. 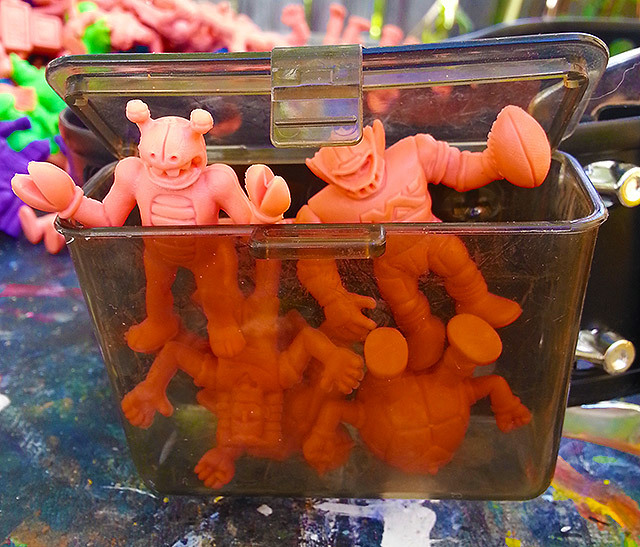 The toys were made cheap and sold cheap, so any kid who collected M.U.S.C.L.E. figures didn’t just “have a few.” We all had tons of them. That was partly the point. Raise your hand if you ever commandeered a giant LEGO bucket for your M.U.S.C.L.E. toys. Actually, don’t bother. Didn’t we all? In Japan, most if not all of the characters had names, allegiances and explanations. In the States, their identities were pretty much up to us. We knew that the main good guy was “Muscle Man” and that the main bad guy was “Terri-Bull,” but beyond that, all we could do was look at the figures and decide for ourselves what they were about. That was no easy task! The beauty of the line was in how absolutely bizarre it was. Some of the figures appeared roughly human, but most didn’t. One M.U.S.C.L.E. guy looked like a building; another resembled a giant claw. Then there was the one who appeared to have a teacup for a head. Since the three I just mentioned were some of the most popular, “nonsensicality” was one of the line’s biggest draws. 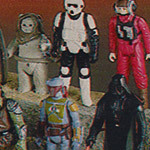 Most people who collected the figures only collected the figures, ignoring Mattel’s few attempts to branch out beyond them. I’ve already covered the Hard Knockin’ Rockin’ Ring, where two M.U.S.C.L.E. 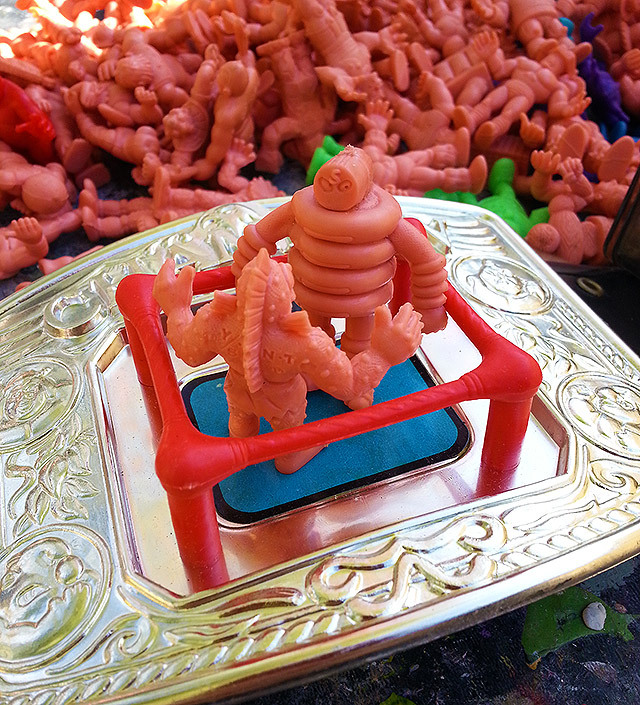 wrestlers squared off in a miniaturized, extra weird version of Rock ‘Em, Sock ‘Em Robots. 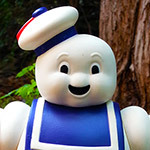 Today, I want to focus on Mattel’s other big extra. A little thing called the Battlin’ Belt. Remembering that M.U.S.C.L.E. was about wrestling at heart, most of the accessories played into that. The Battlin’ Belt was essentially a carrying case, but it was made to look like an honest-to-goodness championship belt. Specifically, the one Ric Flair wore in the NWA. Sure, his was a lot bigger, but his didn’t come with little plastic pockets full of tiny pink monsters. Nor did you have to take headbutts from Harley Race to get it. Why was this important? Well, under normal circumstances, picking your favorite M.U.S.C.L.E. character was borderline impossible. With the Battlin’ Belt, you were FORCED to. If you were going to cart exactly one M.U.S.C.L.E. figure around in a box stationed directly over your crotch, of course it had to be your favorite. 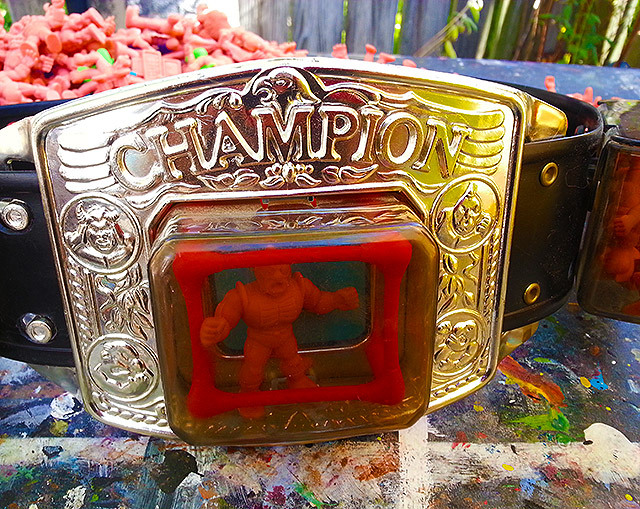 With the Battlin’ Belt, you would learn, unequivocally, which was your favorite figure. Who would it be? Giant Hand Guy? Teacup Head? The dude covered in circular saw blades? Good luck making the most important decision of your life. Flanking the golden “buckle” were two removable plastic boxes. 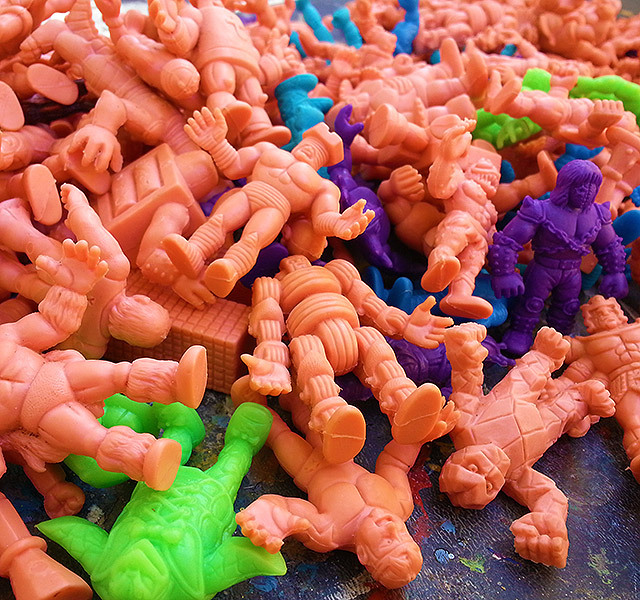 Each could hold roughly five figures, so counting the hero in the middle, you could only comfortably squeeze eleven M.U.S.C.L.E. men onto this belt. That lowers the grade if you’re thinking of this as a “carrying case,” but I’m fine with leaving a bunch of figures on the floor if it means I get to be world champion. I’m betting most kids stretched the bins to their limit and stuffed as many as eight figures in each. Of course, they kind of screwed themselves by doing so, because one of the best aspects of the Battlin’ Belt is the sound of a loosely-filled M.U.S.C.L.E. container jiggling while you walk. Remember Lucy’s change jar? This is even better. And now, this. The Battlin’ Belt’s neatest feature. Remember that special box on the front? It pops off to reveal an excruciatingly small wrestling ring! It’s big enough for two figures to fit inside, but I wouldn’t expect any running lariats. I’ve read many complaints about the ring’s size, but I doubt that mattered much to actual kids. Pretending was our trade! Who cares if it was scaled less like a wrestling ring and more like the ring-themed golf cart that brought Andre down the aisle at Wrestlemania III? As long as we could cram a couple of pink monsters in there, it worked. I don’t think Mattel had much faith in the Battlin’ Belt. In the one TV commercial where it was featured, nearly all of the time was spent on the (admittedly cooler) Hard Knockin’ Rockin’ Ring. If you didn’t grow up with M.U.S.C.L.E, you’ve still felt their influence. 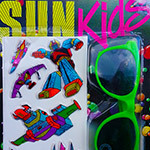 Some would argue the point, but I think everything from Trash Pack to Squinkies took a page from their playbook. 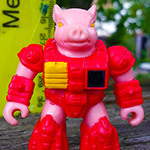 I suppose it’s unfair to consider every toy line consisting of extra small action figures as being inspired by M.U.S.C.L.E., but it’s my dumb blog, where I’m allowed to turn stray thoughts into hard facts. Such a great line. 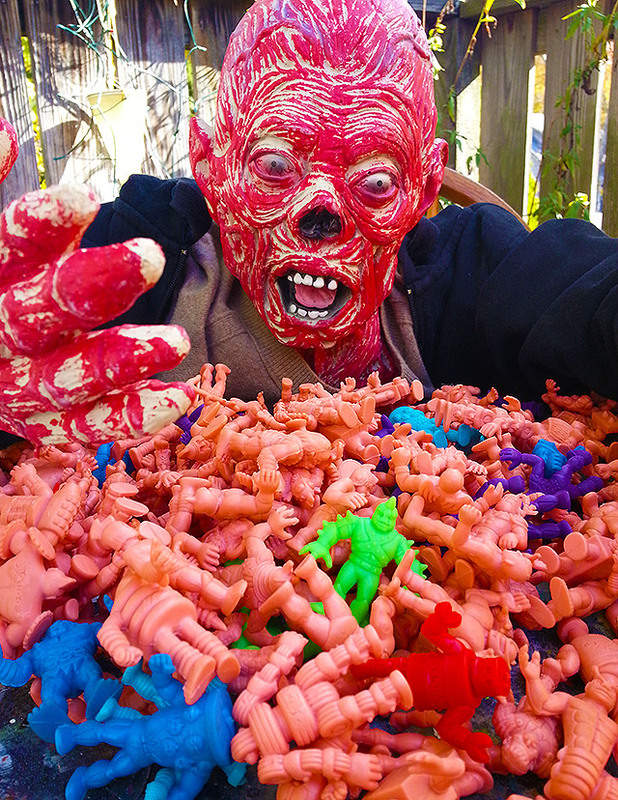 You haven’t lived until you’ve balled up a dozen M.U.S.C.L.E. figures in the palms of your hands. Magic rarely came so cheap. Like M.U.S.C.L.E. figures? 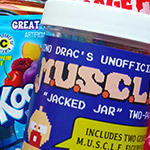 There’s one in each of Dino Drac’s November Funpacks, and in custom Dino Drac packaging to boot! Only a few days left to subscribe, so if interested, the time is now! This is the most ’80s thing ever. 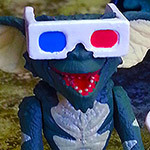 Gremlins ReAction Figures by Funko!